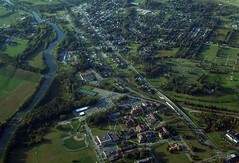 Yesterday I took this picture with my Kodak camera as I was flying over the campus of St. Bonaventure University. St. Bonaventure is situated next to the Allegany River and is adjacent to the Village of Allegany which is also pictured. I was at 4500 feet which is a little over 3000 feet above ground level. It was a beautiful night to be aloft. This entry was posted in Uncategorized and tagged Allegany, Cessna, flying, Franciscan, New York, Olean Cattaraugus Aviation, St. Bonaventure University. Bookmark the permalink.